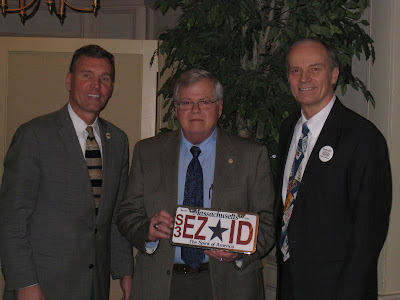 Recently, the New England Association of Chiefs of Police (NEACOP) has unanimously endorsed the EZ-ID bill that I filed and that is co-sponsored by Senator John F. Keenan and Representative Anne M. Gobi, joining a growing list of public safety organizations calling for the bill’s passage. Senate Bill 1798, also known as Molly’s Bill, would direct the Registry of Motor Vehicles to issue license plates that combine the traditional letters and numbers already used with universal, easily distinguishable symbols, such as triangles, squares and other geometric shapes. The bill is named after Molly Bish, a teenager who was abducted while working as a lifeguard in Warren in June of 2000. Molly’s remains were found three years later, but her killer has never been identified. Molly’s Bill would require license plates to pair up to four alpha-numeric characters with one easily recognized symbol. The new format would assist law enforcement officials by making it easier for witnesses to read, identify and remember the license plate of a motor vehicle used in the commission of a crime. In many cases, witnesses are able to recall only a partial license plate, forcing police to run a check on thousands of vehicles to narrow the list of suspects, but symbols are more easily identified. With a standard six-character plate, the number of possible matches can be narrowed to about 1 in 4,300 vehicles, but a plate issued under the EZ-ID bill would narrow the possible combinations to only 1 in 123, making it easier to identify and track down the vehicle. Senate Bill 1798 was the subject of a public hearing before the Joint Committee on Transportation on October 19, 2011. The bill is currently under review by the committee. Implementing the provisions of Molly’s Bill will not only help put criminals behind bars, but also will help to save lives. The new system established by this bill will significantly strengthen the effectiveness of license plates for their main purpose – identifying cars, trucks and other vehicles. I welcome the endorsement of the New England Association of Chiefs of Police, and I intend to continue lobbying the members of the Transportation Committee and stressing the importance of releasing this crucial public safety measure to the Senate floor with a favorable recommendation as quickly as possible. In addition to the NEACOP, Molly’s Bill has also been endorsed by the Massachusetts Chiefs of Police, the Massachusetts Major City Chiefs of Police, the Massachusetts Fraternal Order of Police, the Molly Bish Foundation and the Pioneer Institute. The FBI’s CJIS Division has also deemed the EZ-ID proposal to be “a good idea that can work across the country”. Supporters of Molly’s Bill are urged to call their senator and representative in the state Legislature at (617) 722-2000 to express their support for the bill’s passage. Contact information for individual legislators is available at www.malegislature.gov. Below is a photo of Robert Campbell (center), President of the New England Association of Chiefs of Police holds an EZ-ID license plate with Jay Gardiner (left), Director of the Molly Bish Center and Gary Richard (right), Danvers resident and crafter of the EZ-ID license plate identification system.